I’ve always had a bit of a sweet tooth, and I think there is always room for a little treat. That said, the actual form of treats I enjoy now are quite different than what I would have enjoyed several years ago. 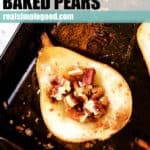 Now, I love to make my treats at home so I can use real food ingredients, and I love goodies like these baked pears because they are super easy to put together and only bake for 25-30 minutes. Plus, you can switch up the ingredients to suit your taste or mood. Sometimes I like mine a little sweeter, while other times something more savory sounds delightful. 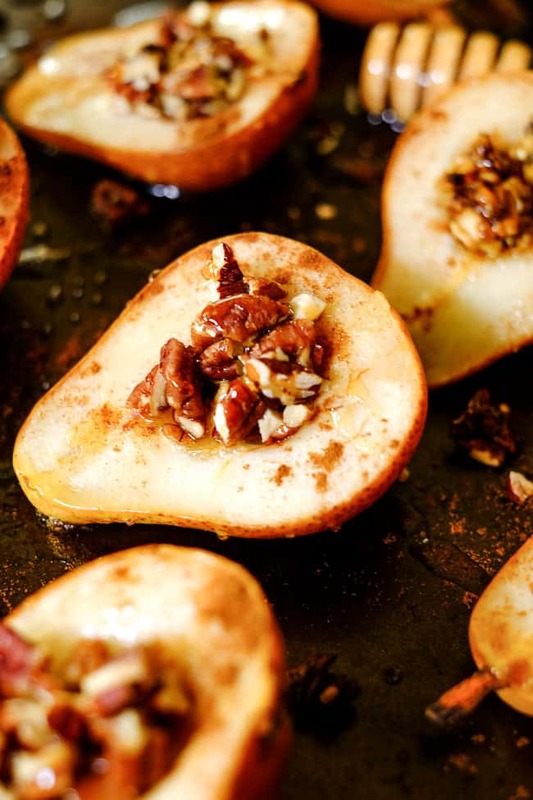 Another great thing about these easy baked pears is that you can get your kiddos involved. 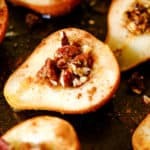 They can make their own pears by using a spoon to scoop out the seedy middle, and then let them go to work with the toppings. It’s fun to set it up like a little bar where they can choose their toppings and make it their own. Everyone gets their favorites and the whole family is happy. 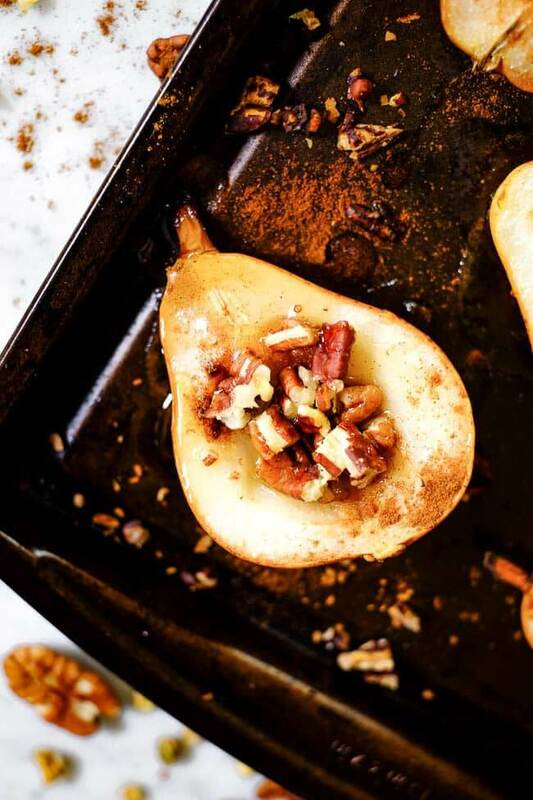 You can take these baked pears lots of directions on the savory to sweet spectrum, but we’ll share some of our favorite toppings as a starting point. After I scoop all the seeds from the middles and carve out little pits to add toppings, I like to start with a sprinkle of cinnamon. Nothing says Fall quite like cinnamon in my opinion. Then, I add chopped nuts or grain-free granola (we love Lark Ellen Farms) and a drizzle of honey. Those are the simplest go-to’s for us. After the pears come out of the oven you can drizzle with balsamic vinegar, salted caramel, coconut butter, add a dollop of coconut yogurt or coconut milk ice cream. You can also go savory by sprinkling on some bacon pieces. If you tolerate cheese, adding some buffalo mozzarella on top before the pears go in the oven is pretty tasty too. Looking for a Fall inspired treat, made with real food ingredients? 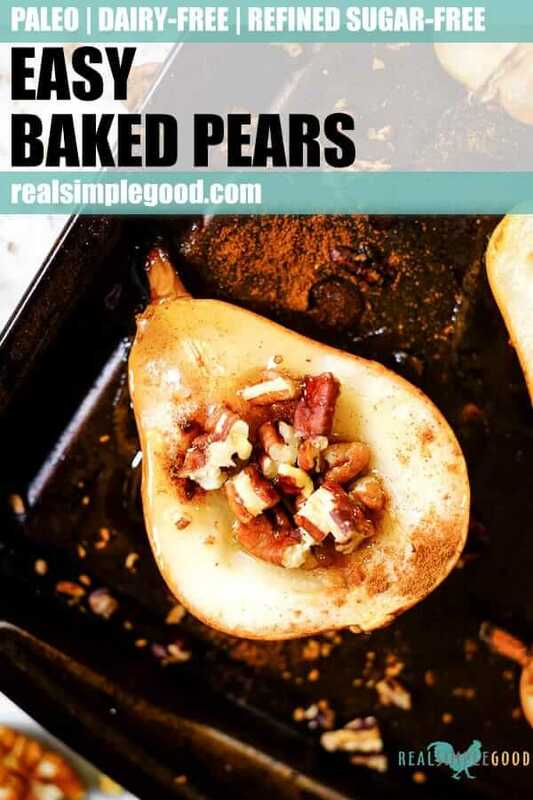 Make these easy baked pears! Customize the toppings to fit your family’s preferences and enjoy! Leave a comment below to let us know what you think. Also, take a pic and share on Instagram. Tag us @realsimplegood and give us a follow if you don’t already! We’d love to stay connected. 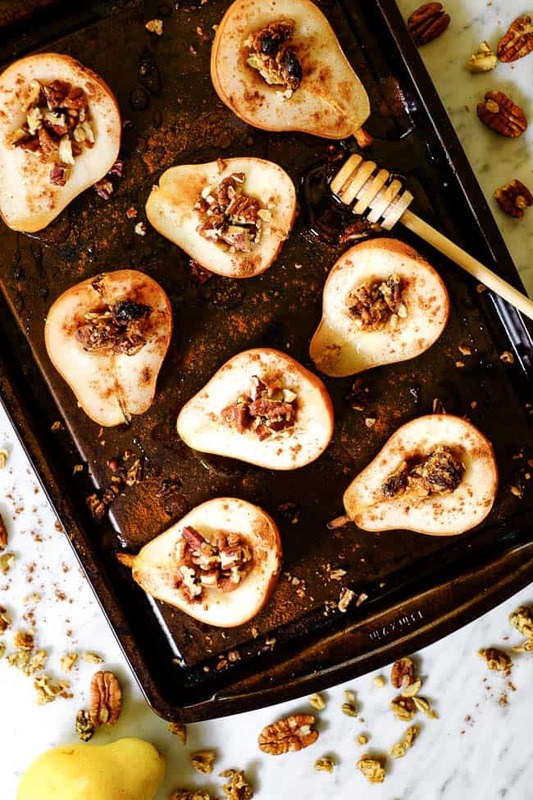 These easy baked pears are Paleo-friendly, dairy-free and refined sugar-free. With simple ingredients and customizable toppings, they're family-friendly! 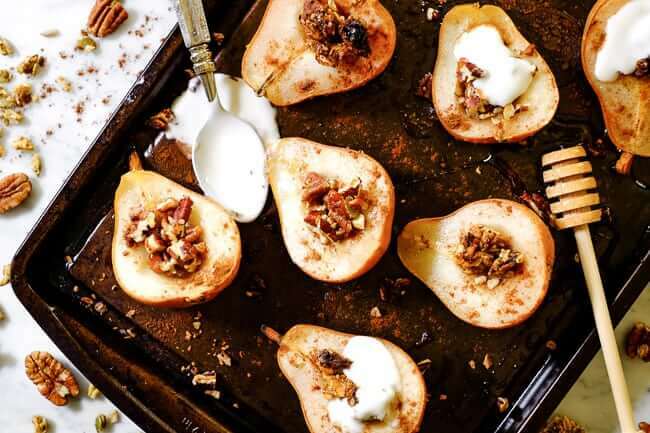 Spinkle pear halves with cinnamon.